<------------------That's my horse. And no, that's not what this post is about. But that's Pandora. So we went to the annual picnic at E's school and we met a family that will be redistricted into hers next year. It turns out they live relatively close, as the crow flies. 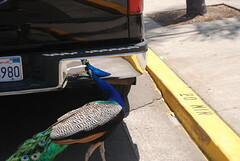 And in the general conversation about enjoying the local fauna, The Peacocks came up. We hear them every spring and then all through the summer and then they go silent. We're not that close to them, but the sound really carries. And this family lives even closer to them. The peacocks are on a property that has been in the same family for close to a hundred years, as far as folks can tell. We know about them though another neighbor. It seems this old area family is where the peacocks live, verifying something another neighbor had told us. But wait. It gets better. We asked whether he knew what they did with the peacocks in the winter. Did they put them indoors? Did they kill them and start with a new brood each year? There were certainly more peacocks this spring. He said that as far as they knew, the peacocks were feral and had been returning to that farm every year for as long as anyone could remember. Every spring they show up. And every fall they migrate away. Fascinating, if true. Peacocks fend for themselves pretty well, much better than chickens do. And they would obviously go south for the winter. But looking peacocks up online, I can only get verification of feral populations in Florida and Hawaii, zoo escapees. Some part of me says these folks that have the peacocks may not be telling the neighbors the truth. I can't help but think "thanksgiving dinner, xmas dinner, new year's dinner...."
One from the zoo, who seemed to have wandered out the exit gate and was poking at that other peacock he could see in the truck's bumper. Mmm, peacock pot pie . . . The peacocks get there somehow if they're not being replaced yearly. It's a question of how far they go and if not far, why are they so quiet all winter? Maybe they could go towards the VA shoreline where it might be milder. But obviously, not as far as Florida. Mystery to be investigated over time and with interrogation and deductive skills. Pandora stays in Tucson if possible. She has a herd, likes being in her herd, likes being in the desert (she used to be in WA) and Judy is her main human. I'm the backup plan. If anything happened to Judy, yes, I would ship Pandora east at great expense to live out her days in my paddock being adored. She was much neglected in her former life, treated as a brood mare with no other purpose. She's happier with humans to ride her and fuss over her. Especially two humans who think she's just a marvelous specimen of her particular Lipizzan lineage. Oh! A cryptic message! Were you just at DHF? It's been an interesting journey for me the past few visits. I'm not a rider, though I did as a girl and I never got over my horse phase. It just never fit into my life again after my parents let me go to horse camps. I was bowled over by DHF and by Pandora in particular on my first visit. (By Camilla too, but in a different way.) I hadn't been around horses in years. At first my visits weren't about the horses. But this year, there's so much positive energy there and the herd was so willing to have me in with them. And for the first time, I could start to feel their dynamics, the flow of it. Instead of being overwhelmed by size and strength, I just feel a sense of awe around them. Hard to describe. Pandora seems to think I'm to get myself back in shape, get flexible, get up on her back and learn to ride all over again or maybe properly for the first time. Pushy broad. I am horsey, and did the first SRS Clinic with Judy, a couple of years ago- to make things slightly less cryptic. I rode Pandora at the clinic. I have Tennessee Walkers and an arab, and tend to be tied to home, so I haven't been back down since. I've also been lately Not Working Enough, so while time was possible, money was not. I'm up in BC, Canada. Most of my posts tend to be flocked, but I'll add you, on the terribly egocentric idea that you might care ;). Pandora is lovely! How nice that she found a real home. I always thought it was unfair that peacocks are always called peacocks and not peafowl, as technically only the male is a peacock. But I guess cows balance out the species unfairness, as people tend to say cows when they mean cattle. My mom's peafowl lived on the ranch all year around, roosting high in the oak tree. Could be they're just noisier in the spring when they're courting. The male makes a loud cry at the end of his dance, and the female has her own cry when she flies from the nest. Their habits are a lot like those of the wild turkeys that live beside my present house. The turkeys also seem to disappear in the winter and reappear in the spring, but I don't believe they migrate.